If you’d like to join the official pledge, to hold elected officials accountable and halt campaign donations to incumbents, then click here for the upward spiral facebook page. I love our country. And I am a beneficiary of the promise of America. But today, I am very concerned that at times I do not recognize the America that I love. Like so many of you, I am deeply disappointed by the pervasive failure of leadership in Washington. And also like you, I am frustrated by our political leaders’ steadfast refusal to recognize that, for every day they perpetuate partisan conflict and put ideology over country, America and Americans suffer from the combined effects of paralysis and uncertainty. Americans can’t find jobs. Small businesses can’t get credit. And the fracturing of consumer confidence continues. First, to withhold political campaign contributions until a transparent, comprehensive, bipartisan debt-and-deficit package is reached that honestly, and fairly, sets America on a path to long-term financial health and security. Second, to do all we can to break the cycle of economic uncertainty that grips our country by committing to accelerate investment in jobs and hiring. In the weeks since then, I have been overwhelmed by the heartfelt stories of Americans from across the country, sharing their anguish over losing hope in the strongest and most galvanizing force of all – the American Dream. Some feel they have no voice. Others feel they no longer matter. And many feel they have been left behind. America is at a fragile and critical moment in its history. We must restore hope in the American Dream. We must celebrate all that America stands for around the world. And while our Founding Fathers recognized the constructive value of political debate, we must send the message to today’s elected officials in a civil, respectful voice they hear and understand, that the time to put citizenship ahead of partisanship is now. Yours is the voice that can help ignite the contagious upward spiral of confidence that our country desperately needs. I RSVP’d for the town hall, and hope you will too! Something has gone missing from the syrups at Starbucks. I have read HS’s letter several times and am curious is he going to end up running for public office in WA state or on a national level? Am curious as to what other people think. @purple1 – Funny you should say that. I dropped by a Starbucks close to home last night, and a partner who sees me often wondered if Howard was going to end up running for public office? It was just a conversation, but I bet that is something that many people have thought of. I don’t really see it happening, but heck, I’d vote for him! I got that email letter from HS too. I already signed the petition a while back. Then I see all the hub-bub on msi. (about the email) Apparently quite a few people either resent that he used their Sbux email address for this purpose or are just against anything “political” coming out out Sbux. (I don’t remember seeing the big protest when there was free coffee on election day, 2008. eveyone and their brother was in Sbux, people who obviously do not drink it regularly) Personally, having never seen it done HERE before, free coffee if you vote..which just turned into free coffee all the way ’round….I actually DID consider that a bit political. seemed so ironic that after all these yrs suddenly Sbux would “reward” anyone who voted in the 2008 election. My question re: this statement from H.S. would be: what exactly does he mean by “withholding….UNTIL a transparent…” bla bla bla. ??? that would seem very subjective..the “until….” part. And, as far as seeing him running for political office? I don’t see it. I did not receive this e-mail but did see all the ojections to using Starbucks’ e-mail list on MSI. Personally I agree with Denise and don’t see anything wrong with it but I can understand why some people would be a little adgitated (I hope I spelled it right) and I am sure Howard’s legal staff approved using Starbucks’ data base. Incidentally I hope that after the town hall more, a lot more, people will sign the petition. Last time I check there were only 258 signed which is quite disappointing to say the least. Good morning Steve and all. On my phne, sorry so sloppy. I wonder who all got the email. What an uprising abt it on MSI. The thing is, for every one comment, there could be 100 silent folks that feel the same way. I dont see a big deal in sending it. For the life of me, I have no clue WHO got it. Steve youre a shareholder, right? You didnt get it. There is sort of an underlying question of how sbux subdivides their database. And I dont think HSvwants to run 4 office. Ok, I have more thoughts but too hard to type on my phone. I got the email and am not a shareholder. It is an interesting question for sure to determine how SB decides on what customer gets what email, what promotion, etc. This I think has been a long standing question. Yes I am a shareholder. Not a big one maybe 16,000 shares and, since I have my dividends reinvested instead of sent to me, I get more shares every time Starbucks pays a dividend. I don’t feel left out though that I didn’t get a letter and in fact sort of glad I didn’t. What I do feel sort of left out on is when I got out of the hospital and rehab and wound up in assisted living where I had computer access I heard about people getting a free frappuccino post card and thought “what a nice home coming surprise that would be”. When I got home I looked through my plethora of mail but sadly enough it wasn’t there. I did get the email. Of course like everyone I don’t know the criteria, but I bet most people will get it. I’m sure he wants as big of a turnout possible…so I’m sure it will be sent to many registered members, gold level or not! The email appeared to hit those of us on a Starbucks consumer email list… Perhaps signed up through Starbucks.com or Starbucksstore.com? The only other idea I have is those who attached an email to their gold card, as the only other emails I seem to get from them are gold card-related. As for Schultz using the Starbucks pulpit to garner support for what would appear to be a personal crusade against Washington, I’m fine with it. Reminds me of when Jim Sinegal and Costco spearheaded the ballot initiatives in Washington to de-regulate liquor sales. Would have helped the company’s bottom line to be able to sell their deliciously cheap booze in stores. Similarly with Starbucks, I expect Schultz is concerned about the economy stalling back out, and we all remember what happened to the company’s profits and stock price back in 2008 when this last happened. If we enter another recession, Starbucks could be an affordable luxury that many consumers cut back on (or cut out altogether) once again, regardless of whether or not you buy into the transformation and strengthened “underlying fundamentals” we keep hearing about on earnings calls. 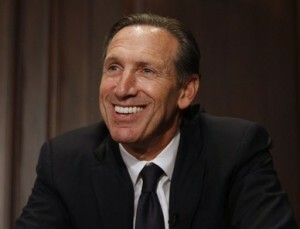 To wrap it up, if Starbucks and Schultz can use their size and connection to millions of Americans to advocate for change that strengthens the economy, presumably strengthening their financials and stock price in the process, it almost feels like it would be irresponsible not to do so. At least, I’m glad somebody is doing something! @calwatch: it is literally impossible to have a “gridlock” from “only one side….’. There would be no gridlock if BOTH “sides” were not involved. ??? do this, I will do that and that, and….. to fix the problem. American people want to know what , why , and HOW (WILL BE DONE) no more retorics. And gongressmen stay in town you have a lot of work to take care, you are paid for that. Thanks, A.K. Did anyone else tune into this? I watched for about an hour. What did you think? The email was sent to registered card holders…my brother received two emails as he has two gold card accounts. Personally, I find it completely hypocritical that a CEO who laid off 1/3 of their HQ staff and what, 12,000 partners two years ago would issue a call for companies to hire unemployed Americans. I thought it was too long. @Steve – Eeeeek. I am going to agree with you that it was a little long!